Blackline GPS Corp. (TSX VENTURE:BLN) ("Blackline") today announces Loner® Duo-the latest addition to Blackline's lone worker safety monitoring portfolio at the Safety & Health Expo 2015, the largest UK event driving excellence for global health and safety. Loner Duo is a compact wearable device that greatly enhances the recently-announced Loner® Mobile worker safety monitoring app for leading smartphones. Loner Duo connects to Loner Mobile via Bluetooth® low energy communications, and together form the most complete smartphone safety monitoring system to address moderate to high-risk applications. Smartphone safety monitoring apps are typically appropriate only for lower risk applications when used on their own due to the difficulty in accessing the app to initiate an alarm and the lack of automatic incident detection capability. 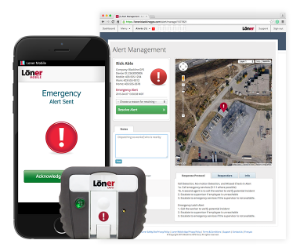 By combining Loner Duo with the Loner Mobile app, an organization is able to leverage a valuable combination of automatic detection and manual alerting features not possible to implement within a safety app by itself. When Loner Duo detects a fall, a motionless employee, or the the emergency latch is pulled-Loner Mobile automatically communicates a safety alert to monitoring personnel who manage a swift emergency response to the employee's precise location. "To request help, every standalone safety app requires workers to have their smartphones within arm's reach, unlock the device, find the app and interact with an emergency control, taking away precious seconds a worker may not have," says Gavin Boorman, Managing Director, Blackline GPS Europe. "Being worn by the user, Loner Duo is the critical, physical interface that enables a user to instantly call for help-even if his or her smartphone is located in a pocket, purse or briefcase." Every industry and application is unique-Loner Duo and Loner Mobile were designed from the ground up to meet this challenge. Small businesses through to multi-national corporations will benefit from a lower cost of ownership than a dedicated safety monitoring device while achieving a nearly equivalent level of monitoring rigor. When an alert is triggered, Loner Duo works in conjunction with Loner Mobile's two-way voice calling capability to a programmable number and dedicated monitoring personnel. The employee's location, as computed by the smartphone, is communicated along with the employee's identity in order to manage an efficient emergency response. Loner Duo and Loner Mobile are also configurable over-the-air to meet a broad range of customer requirements. At the Safety & Health Expo, located at the ExCeL London Exhibition and Convention, Blackline is showcasing its Loner safety monitoring solutions at stall SHE M2060. No matter where an employee is located-within buildings, populated areas or the remote reaches of our planet, Blackline provides a complete suite of employee safety monitoring solutions to match the challenge. Learn more about Loner Duo, Loner Mobile and other Loner products by visiting Blackline's employee safety monitoring website at www.blacklinesafety.com. About Blackline: Blackline GPS Corp. (TSX VENTURE:BLN) is a wireless location leader that develops, manufactures, and markets products and services for worker safety monitoring. Targeting a broad cross-section of industries where safety is a corporate priority, Blackline's Loner solutions are promoted through offices in Calgary and the United Kingdom, and sold through a growing network of international distributors. Blackline's safety solutions deliver safety and location awareness through mobile messaging, monitoring portal, Blackline's Safety Operations Center, and web services. Blackline's vision is to become the leading supplier of wirelessly connected worker safety monitoring products in the world. Blackline products allow customers to protect their personnel, share the conditions of their environment, and connect with emergency services when necessary. Blackline solutions Protect. Share. Connect.® For more information, visit www.blacklinegps.com. To view the photo associated with this release, please visit the following link: http://www.marketwire.com/library/20150615-1012674-F1.png.